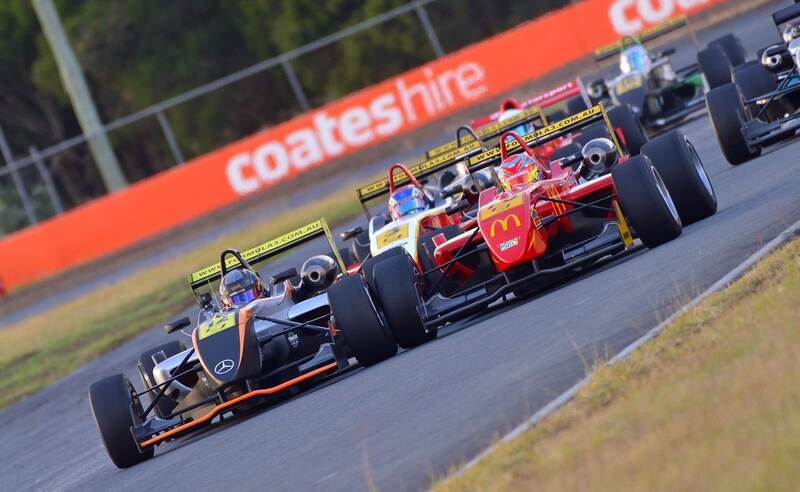 Harri Jones and Cameron Shield were split by two points coming into this weekend of the Formula 3 Premier Race Series, but the former came out of round five with a bigger margin following two race victories. Shields was second in two races, even after stalling at the start of race two before overtaking Jones to take out the third race. Meanwhile third in each went to Nathan Gotch, secured his hold on the NSW Formula Race Car Championship while Roman Krumins’ brace of fourths further enhances his lead in the F3 National standings. Four race starts brought four Improved Production wins for Michael King in his Mitsubishi EVO. Treven Spiteri scored three seconds in his earlier model EVO before a spin in the last relegated him to fourth behind the two leading under two litre cars (the two classes were combined for this their final round). There it was Harrison Cooper (Honda Integra) who won each encounter over rival Kurt Macready (Nissan Silvia) as the pair picked up thirds and fourths before second and third in the last. Dylan Thomas threw everything he could at trying to take a win off Michael Kinsella but couldn’t manage it. The Stinger driver had the lead several times over the three round-five championship races but each time, Kinsella’s Jacer was in front, by 0.002 seconds in races one and two, and 0.1 in the third. Close behind in third place on each occasion was Craig Sparke in another Jacer. The penultimate round of the NSW Formula Ford Championship went to Nathan Herne who now takes over the title chase lead. He didn’t make the best start in any of the three races but was able to forge to the lead in each, winning two, before Tom Sargent and Lachlan Mineeff came up with the strategy to relegate Herne to third in the last. Jason Molle had the jump at the start of the first HQ Holden race, his brother Chris replicated that in races two and three, but each time it was Brett Osborn who won the races. Osborn is on-track to take his third straight title, with three wins this weekend, beating Chris Molle each time while Duane Cambridge filled third spot. Production Sports Cars joined the program for Sunday only with two 30-minute races. Daniel Gaunt won the first with an all-the-way win, lapping the entire field in an Audi R8 LMS Ultra. Second went to Andrew Macpherson (Porsche GT3-R) with third going to Geoff Morgan (Porsche 911 GT3 Cup Car). Gary Higgon took over the winning car for the second race. He was second off the start but several spins relegated him to seventh. Meanwhile Macpherson led until passed by race winner Scott Fleming in Iain Pretty’s Roaring Forties GT40. Again Morgan was third.